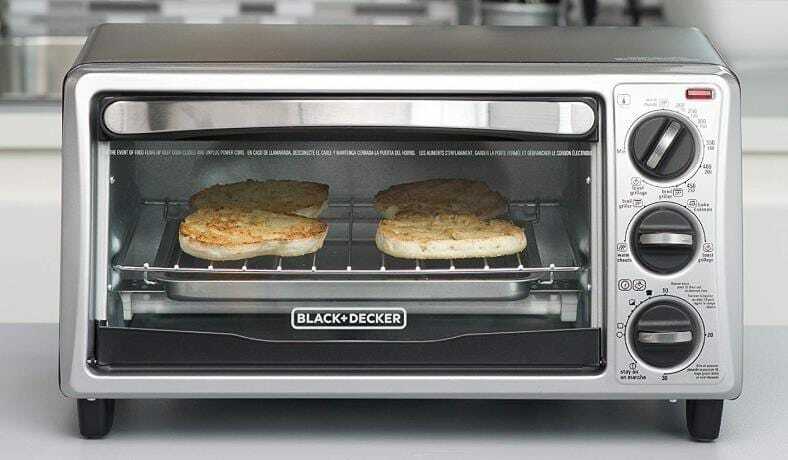 What if you could make not just toast, but also bake mini pizzas, reheat your dinner or lunch, or toast your bagels using only a fraction of the time, energy, and cost of a larger oven? A toaster oven will let you do all of these in a fraction of the time of an expensive and bulky traditional oven. If you shop smart it’s possible to get some of the best toaster ovens for under $50. Below you’ll find 4 unbeatable models along with reviews, details, and more. You’ll also learn some great toaster oven facts before spending a single penny! 2. What is a toaster oven and how do they work? 3. What can I cook in a toaster oven? What is a toaster oven and how do they work? Toaster ovens are like a smaller version of standard ovens. However, despite offering extra convenience features, they’re also very cost-effective and affordable! While the name “toaster” may lead you to think they’re mainly for baking or toasting breads, in fact they’re extremely versatile. Toaster ovens are small cooking ovens that generate heat using electrical heating elements in order to cook food by transferring heat to the food. Most of today’s toaster ovens are in fact convection ovens which use an internal fan to distribute the heat more evenly and give a better cooking experience. They’re essentially extremely similar to traditional ovens you’ll see in homes and other areas with a kitchen. However, generally speaking there are some differences that add convenience. Additionally, they may have features standard ovens do not (with the exception or higher-priced models). 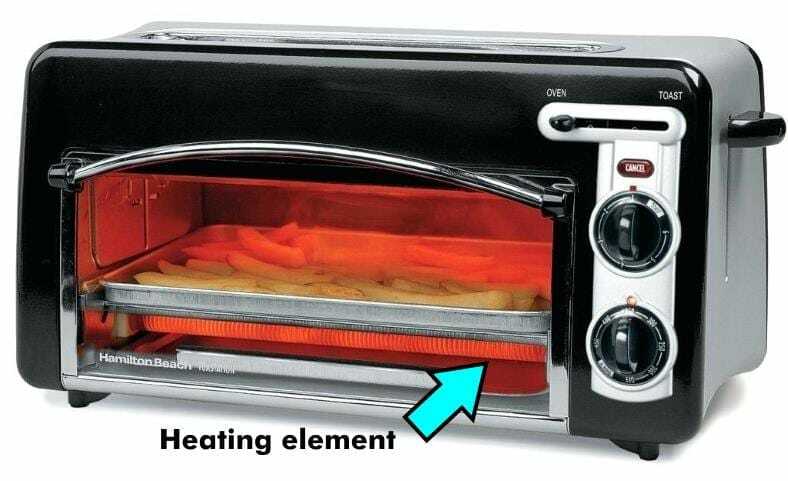 A toaster oven, much like a typical electric oven, uses electrical heating elements which change electrical energy into heat. The number used depends on the cooking settings and the temperature the product design can offer. While the name “toaster oven” may lead you to believe they have a limited number of purposes, they’re very useful for a variety of cooking tasks. It’s really up to as well as how much money you’d like to spend, as the features offered vary by model and price. They’re a wonderful use of money and space, as for the dollar you typically get a good value. One of the most common features of some toaster ovens is a special bread or bagel toasting area built-in (normally on top). 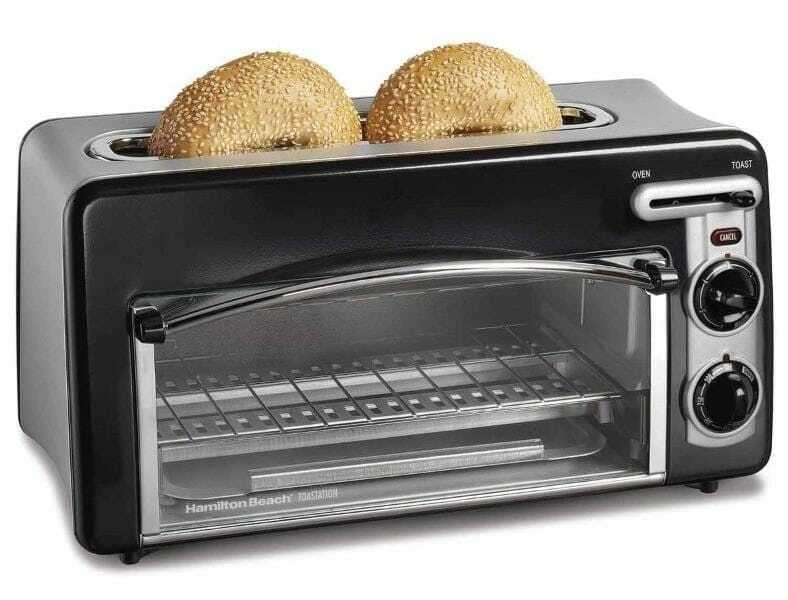 It’s a great way to more quickly get real toast without need to use the main heater compartment. Note the crumb tray inside in the bottom. As I mentioned earlier, toaster ovens often offer more features. That’s especially true for toasting breads and bagels, for example. Generally speaking they’re also quite easy to use, as they’re often controlled by rotary dials used to select the cooking temperature, cooking mode, and the timer if provided. You’re limited nearly to only what you can think of! There are some amazing possibilities when it comes to cooking options with your new toaster oven. Meats, vegetables, and even crisp, delicious pizzas are just the beginning. Baking bread and desserts are simple and fun, too! Nearly anything you can cook with a conventional (large) oven can also be cooked in a toaster oven. The limitations are simply the amount of room you have and your toaster oven’s options. There is one disadvantage, aside from size: unlike larger ovens you’re more limited in the pans you’ll be able to fit inside. That means you’ll have to shop a bit more carefully for what you need beforehand. Which features should you be shopping for? Honestly, it really depends a lot on the types of food you’ll be cooking as well as what you can afford. I’ll list some of the basic features that are really helpful but bear in mind that they’re not necessary – just more convenient in most cases. 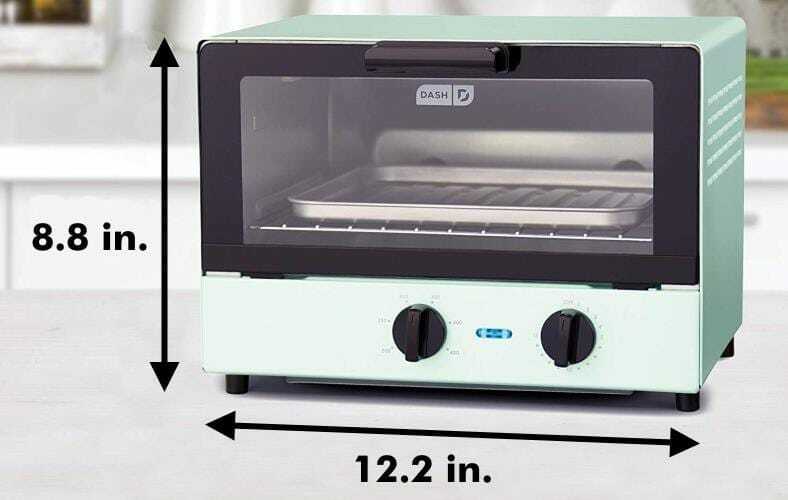 Timer/auto-shutoff: This will give you the option to “set it and forget it.” When the cooking timer is used you’ll be able to use your toaster oven without concern for overcooking or burning your food (see note below). Food temp presets: This is a convenience feature which makes cooking common foods easier. When available, just set the dial to the preset and it will warm to the correct temperature without any guessing. Operating modes: Multiple operating modes offer more ways to cook food. The more, the better. Broil, bake, air fry, and warm are some of the most useful functions to look for. Digital display: Where available, digital displays are much more accurate for knowing the current cooking temperature than analog (dial) controls. It’s usually a feature on more expensive models, however. 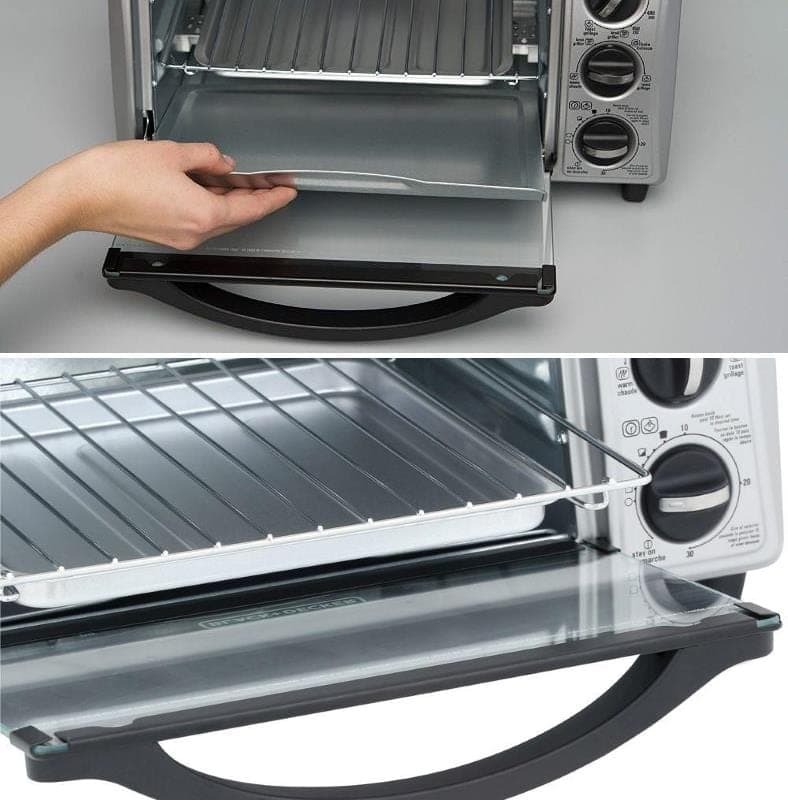 Removable crumb tray: A feature on many toaster ovens including budget models, a crumb tray catches crumbs or drips and makes cleanup easy. Just remove the crumb tray and wipe it clean (or wash) and put it back in. 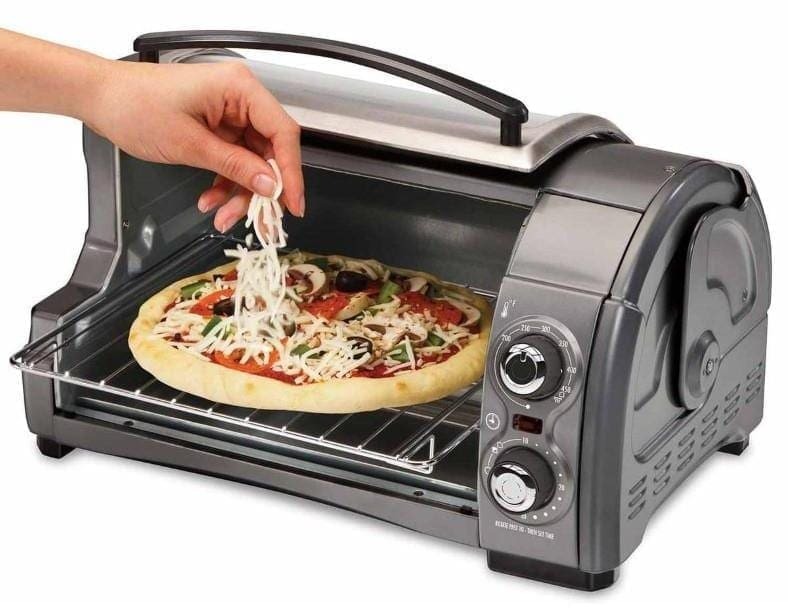 Pizza-capable design: As toaster ovens are fantastic for cooking personal-sized pizzas, if you enjoy pizza you’ll want to look for the size capability. Some brands specify this clearly while others do not. For example, some are advertised as working with pizzas up to 9″ in diameter. Be sure to check the dimensions if provided if that’s a food you’d like to cook. Warming mode: Want to keep your food warm, or re-heat cold takeout? A warming feature keeps the oven in a low-heat state to keep food warm and tasty. Not all ovens feature this, so be sure to check if it’s helpful for you. 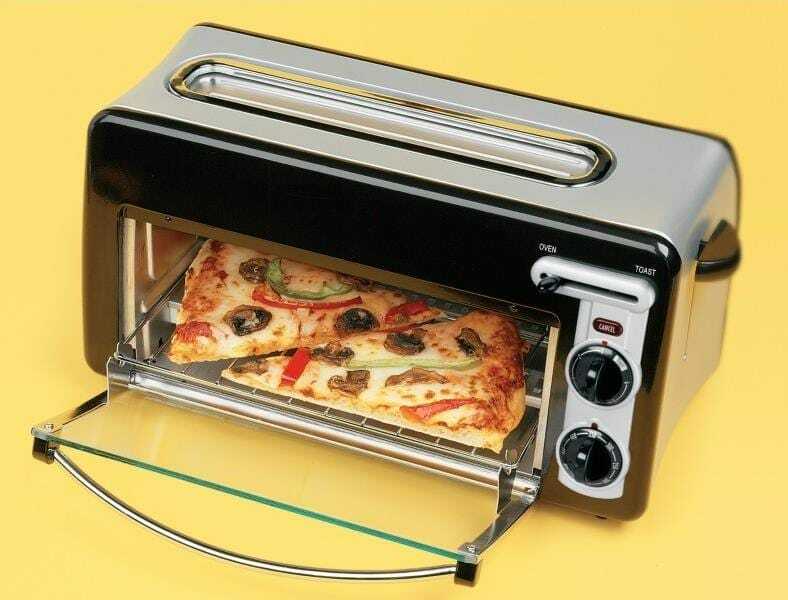 Fantastic for toast, pizza, even cookies! 1. Black and Decker 4-Slice Stainless Steel – Great value! Excellent features, fast/easy cooking, and auto-off timer. While there are tons of choices out there, here’s one I feel is really a great all-around winner. The Black and Decker 4-slice (model TO1313SBD) is a super-popular choice and a great value! It’s simply one of the best values under $50 you can buy today. With its durable stainless steel construction, handsome and simple control panel, good basic features, and easy-open front door, it’s one of the best options under $50 for most buyers. It features the company’s EvenToast technology to create toasted bread that’s 30% more evenly done than the competition. It’s perfect for a wide range cooking jobs when you don’t want to invest a lot of money but still want great results. Controls are simple to use, but you won’t come up short on features despite the low price! Temperature presets, a timer feature, and 4 cooking functions cover nearly all basic cooking jobs. A power light also shows when the unit has finished when using the timer. Despite being one of the most affordable on the market, features are good. Bread, bagels, and much more toast nearly perfectly thanks to the even heat distribution – 30% better than competitors! You can fit up to 4 slices of bread (or similarly sized items) on the cooking tray. A lower removable crumb tray makes cleanup easy. Wanting some of the most delicious bread around? Enjoy some of the best toast you’ve ever had – up to 4 slices at a time. The EvenToast technology offers up to 30% more evenly toasted results than the leading competitors. When done, simply slide out the bottom crumb tray for easy cleanup. It’s a nice feature I like. The included baking/broiling/drip pan stores neatly just underneath, which is a pretty cool feature. Top: Pull out the crumb tray for easy cleanup after toasting your favorite bread. Bottom: The cooking rack, which also stores the baking/broiling/drip pan, slides out easily for washing too. A handsome flip-down glass door provides great cooking viewing while in use. Additionally, the heat-resistant handle avoids burns while it’s hot. Although at about only 16.5 x 10″ in size, don’t let the nice compactness full you – it’s capable of producing lots of great meals! While it’s a small oven, which means you won’t be able to cook a whole tray of chicken breast filets, it’s perfect for single snacks or meals in less time than a conventional oven. It also heats up pretty quickly. I do have a few minor complaints – the outside surface gets quite warm while in use (the front handle is fine to touch). Additionally, the baking/broiling tray isn’t the full width of the top rack which is a bit disappointing. However, despite the minor quibbles, it’s a fun (and easy!) to use oven that toasts and cooks well. It’s also one of the most affordable models sold today. 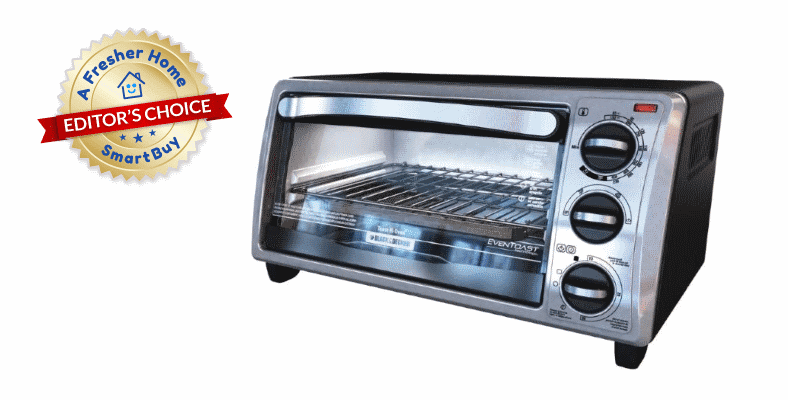 It’s one of the best and easiest to use affordable toast ovens you’ll find – so much so that I awarded it my Editor’s Choice rating. 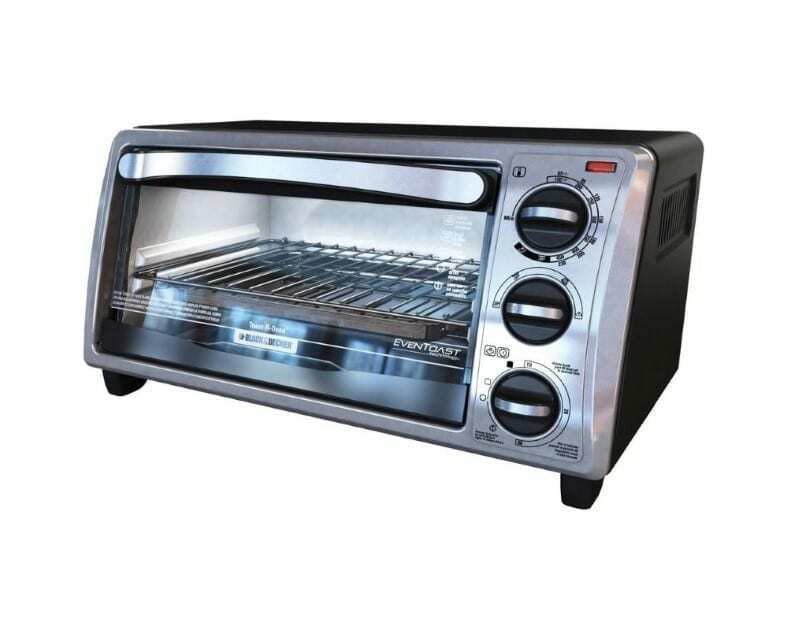 Looking for a basic toaster oven that gets the job done well, has good features, and that you can afford? This is it! Head over and find the lowest price (with free shipping!) at Amazon now. 2. 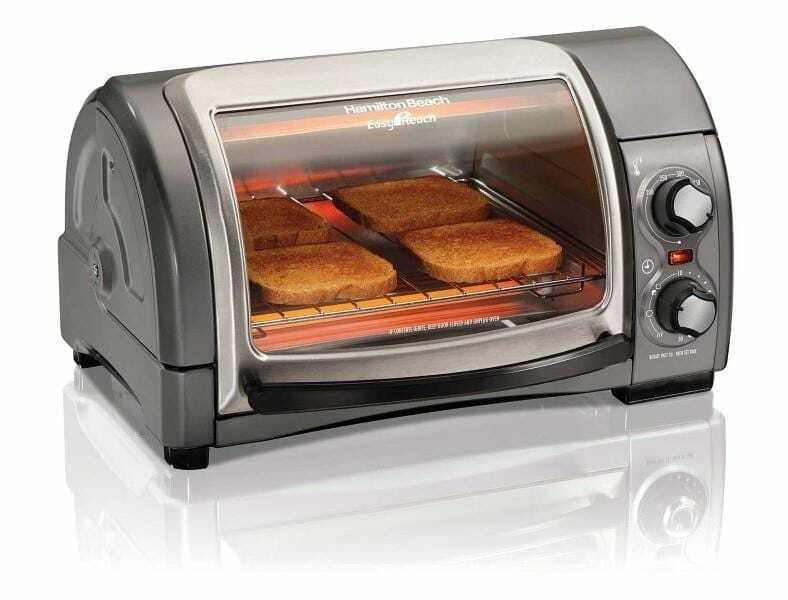 Hamilton Beach Toastation 2-Slice – Pop-up toaster convenience with mini oven cooking power. Ready for simple, reliable, and affordable toasting and cooking? 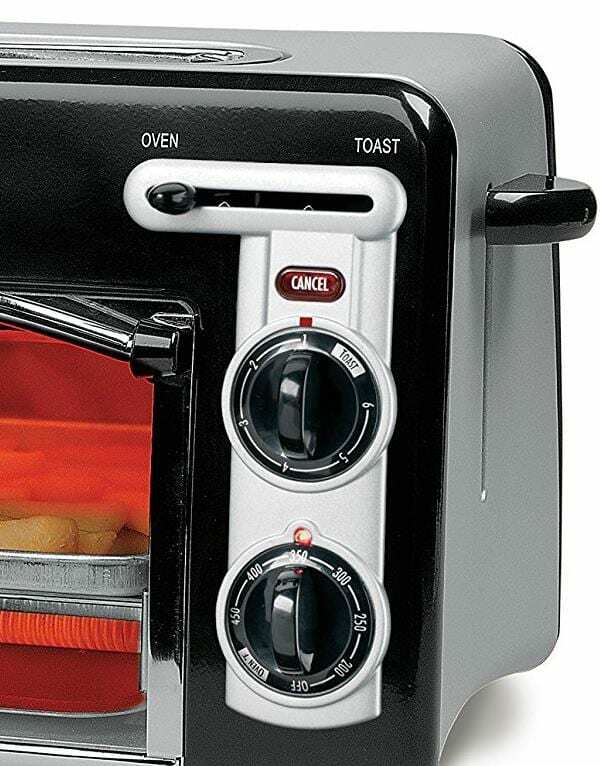 The Hamilton Beach Toastation 2-slice toaster oven is a space-saving way to get delicious cooking results. It’s not just a compact mini-oven. For added convenience, a remarkably easy-to-use 2-slice traditional pop-up toaster is built into the top. Just like traditional toasters, there’s a pop-up control on the side. Measuring only 9 x 17.3 9.3 inches in size, it fits well into both small kitchens, dorm rooms, and limited countertop areas. The Hamilton Beach Toastation is one of the easiest to use toaster ovens you’ll find. 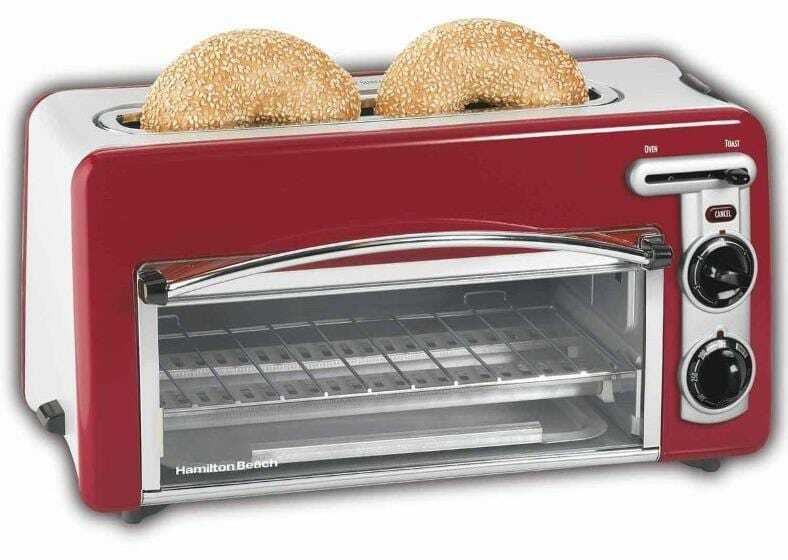 Toasting bread or bagels is VERY easy – just load 2 slices in the top and push the side lever down, just like a traditional toaster, with your toast level dialed in (top dial). Push the Cancel button any time to stop the toasting or cooking process. For oven functions, put the control switch in Oven mode. Then just select any temperature up to 450 degrees using the rotary control. Cooking and toasting are a breeze. Want freshly toasted and delicious bread or bagels? The Toastation toasts 24% faster than leading toaster ovens. Your delicious toast will pop up soon – that’s it! The toaster will shut off automatically. It works well for not just toast or bagels but English muffins, too. For oven baking and other cooking tasks just set the oven to preheat for 15 minutes and you’re read to start. It’s great for cooking or reheating small foods like chicken nuggets, fries, and even small personal pizzas. You can fit up to 2 16″ pizza slices in the cooking rack as well. Pastries are another great idea as well. 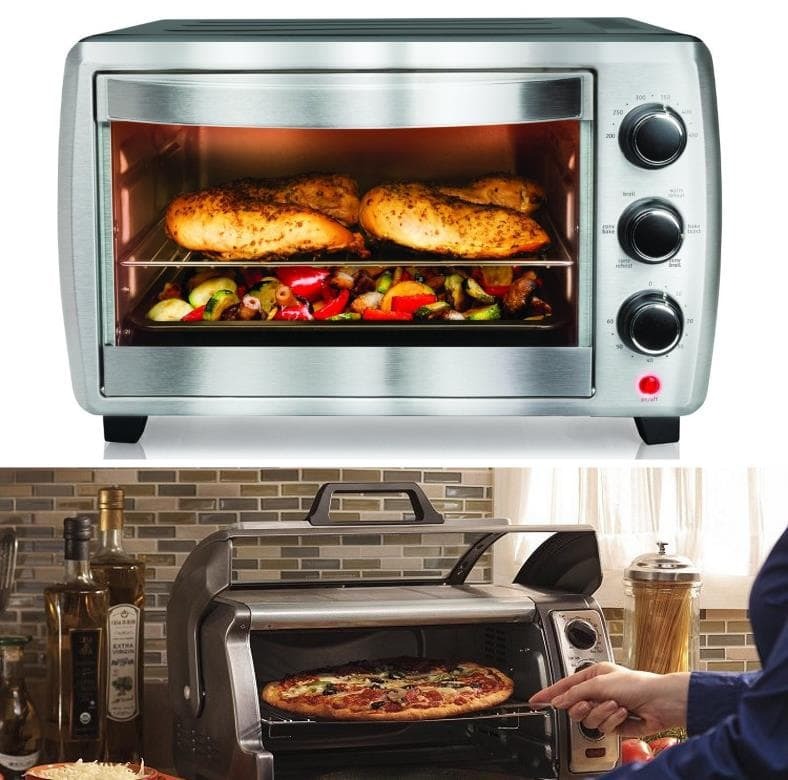 The 2-slice oven is great for reheating or cooking small items like pizza, french fries, fish sticks, and much more. It uses 73% less energy than a traditional oven! One of the things I like the most about the Toastation isn’t just that it’s compact, but it uses a whopping 73% less energy than traditional ovens do. Over time that adds up to a large savings in electricity cost – not to mention how long it takes to use a larger oven, too. 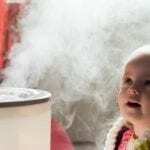 Foods like frozen chicken nuggets or fish sticks cook 28% faster than other ovens as well. When opening the front door the rack slides out for more easily reaching your food. The bottom crumb tray is easy to remove and clean, making maintenance easy as well. The included backing tray is great for many foods including loose french fries, nuggets, and more. 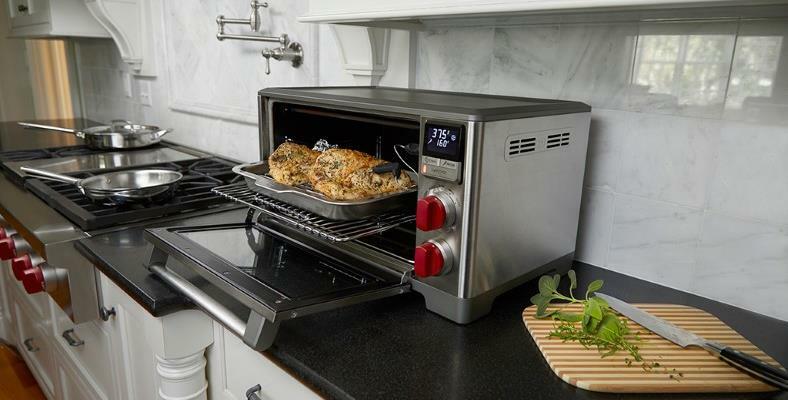 Overall, while it does have its drawbacks (no timer feature, smaller oven cooking area), it’s a great choice if you enjoy fast, adjustable toasting and small cooking needs. If you’re limited on space and primarily need a toaster but want cooking features too, it’s a great option. Overall I find it to be a good compromise between cost, oven cooking, and fast toasting. It’s a good buy I think you’ll enjoy. Have a look today! Check out the many happy buyers and great reviews at Amazon now. 3. Hamilton Beach Easy Reach – Roll top ease in a great-looking package. Featuring a unique design and handsome styling, the Easy Reach toaster oven brings a new spin on great oven cooking and convenience. Not only is it great-looking but it’s actually safer and easier to use than its competitors! The Easy Reach features a special design in which the window and door actually roll back and doesn’t need more front clearance like most. This means it’s a fantastic choice for limited counter space areas. Not only that, but it’s also an advantage as not only is it easier to view your food for easily while it’s cooking, but you’ll also have greater access without risking burns. Unlike traditional designs, the Easy Reach makes accessing your food easier. The roll top is fantastic as it slides right out of the way, allowing you to add cheese, seasoning, sauce, or any number of toppings to cooking food without the risk of getting burned. Not only that, but the curved window allows you to more easily view your food while it’s cooking, unlike most products sold today. What’s especially nice about the Easy Reach is how unlike most products on the market, the oven door doesn’t fold down in the front. Instead, it rolls back to offer a larger, more safely accessible food area. Whether adding cheese to pizza, seasoning or sauces to food you’re cooking, or just checking on your meal, it makes accessing your food a snap. It’s also safer, too, as there’s no need to expose your hand to a hot front door like on most. Top: Need to clean the door? It’s a breeze! You can remove the rolling door and wash it as needed easily. 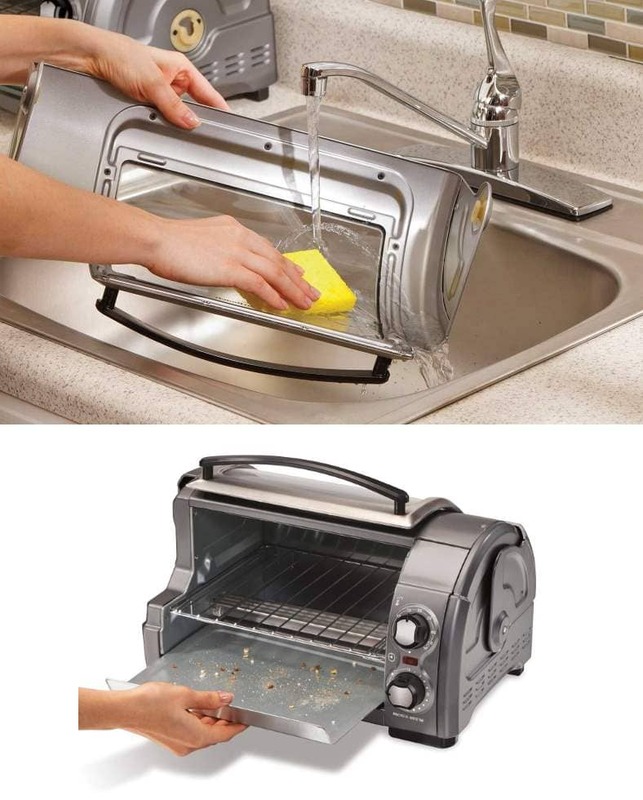 Bottom: After toasting, pull out the removable crumb tray for easy wipe-down clean up. As far as clean up goes, the Easy Reach is one of the best-designed models I’ve seen yet. What’s especially nice about this model is that you can easily remove the rolling door/window and hand wash it using a damp cloth or sponge and soap and water. That’s a truly unique feature I haven’t seen elsewhere, and it makes clean up much easier than I expected. Much like other models on the market, the removable crumb tray slides right out and is easy to wipe off, making clean up after toasting very simple, too. Ok, so what if you need toast? As it turns out, it’s easy to use and can make great toasted bread or bagels. For toasting, the timer dial includes selectable toast darkness levels. For 2 slices of bread, place the oven rack in the middle to get even toasting on the top and bottom. 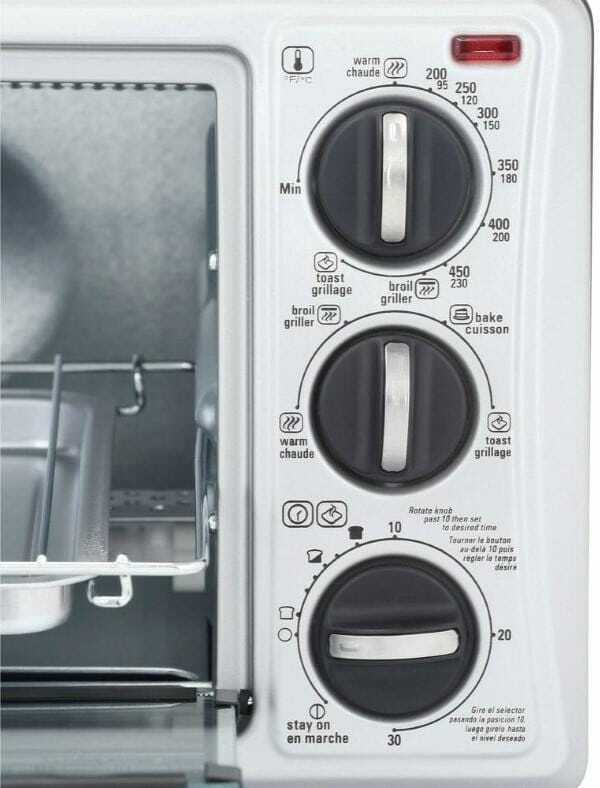 To toast bagels, English muffins, pastries, and waffles, place the oven rack in the lower position, then select a toast color according to the directions. In my experience it works quite well! Bagels and waffles I toasted were very evenly crisped and quite delicious. I was honestly surprised. That’s pretty much it! When the timer shuts off, the Easy Reach will turn of as well and your food will be ready and waiting. Overall, it’s a great little toaster oven and is one of the easiest to use I’ve come across. The manual, while a bit simple, is very clear and helpful. You can cook some excellent foods with great results for a fraction of the electricity (and time!) a larger, more expensive oven takes. Even foods like hamburgers, hot dogs, fish, and sausage only take 15-25 minutes max using it. While it’s not perfect, I’m impressed with the Hamilton Beach Easy Reach toaster oven. It’s especially fantastic for counter top areas with extremely limited space and it makes clean up a breeze. Baking, broiling, and toasting work great and it looks great while doing so – I like it! Find out today why it's one of the best rated affordable toaster ovens at Amazon. 4. 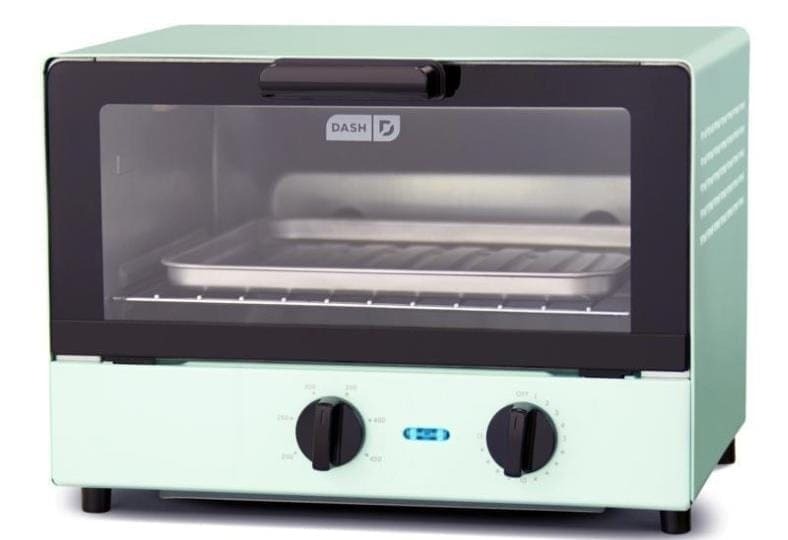 Dash Compact Toaster Oven – Compact, easy, and high quality cooking…on a budget! Ready to fall in love with style all over again? The Dash Compact toaster oven proves that when functions meet smart design great things are possible! Despite being priced below $50, you’ll see right away how much more expensive it looks. With restaurant-quality styling, the user-friendly front door makes it easy to get great cooking functions on a budget. Toasting, baking, and many other tasks are a snap. Just set the temperature and then the timer – and let the Dash do the rest. The power light will stay on while the oven is in use and turn off when the oven shuts off. When the timer runs out and the oven turns off you’ll hear a chime sound. Great results in less space! Despite being incredibly useful it measures a compact 8.8 x 12.2 inches. Since the controls are bottom located instead of on the side (like most competitors) there’s more room inside. It’s also a great fit for small areas like dorm rooms, small kitchens, and other tight spaces. What I especially like about the Dash Compact is the design with places the controls on the bottom and not on the side, giving more oven room in less space. Top: A bottom-located crumb tray slides out for easy wipe-down and cleaning. 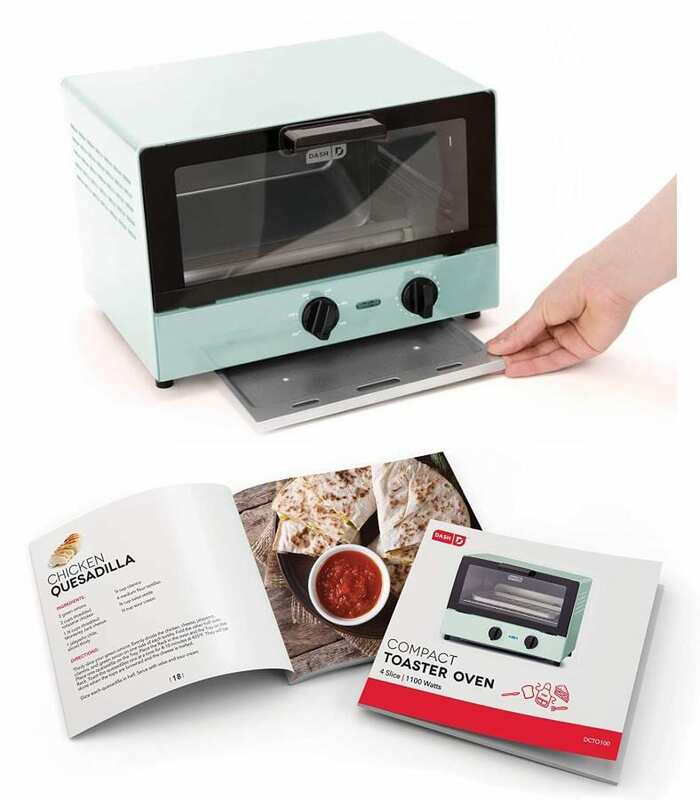 Bottom: You’ll also get a great manual which includes useful toaster oven recipes! Very nice. In addition to the baking pan included, there’s a removable crumb tray (located at the bottom of the unit) which slides right out for easy cleaning. The oven rack is easy to remove as well. Need more cooking ideas? The owner’s manual isn’t just clear and helpful – but also full of great recipes that take advantage of your new oven. One thing I really like about the Dash is that it takes only 3-5 minutes to preheat before cooking. That’s a huge time savings over traditional ovens, and faster than many competing toaster ovens. In my opinion the Dash Compact is a great-looking choice that’s worth the money. While I wish it offered a few more features (toast darkness settings, more than 15 minutes on the timer) it’s a great one. Don’t hesitate to see the great buyer reviews and color options at Amazon. Are you wondering how long a toaster oven takes to warm up before cooking? Find out more about preheating cooking toaster oven facts here.